Note: As part of an independent study this semester at the MIT Media Lab on game design, I've begun blogging about games here:playedgame.tumblr.com. I'll ocassionally cross-post more developed pieces like this one, but feel free to follow that Tumblr if you'd to read more of my writing about games. Like their coin-op arcade ancestors, today’s casual mobile games live or die on their ability to create The Replay Urge: that itch you get to play again immediately at the end of each round. The Urge consists of complex emotional components: the frustration of failure, the drive towards self-improvement, the joy of skill development, the tactile pleasure of manipulating an interface, the inherently addicting quality of random rewards. Games that induce enough of these become “addicting” and find success through deep user engagement and viral spread. Beyond commercial success, however, the specific mix of components a game uses to achieve addictiveness determines its aesthetic effect: whether or not it is actually fun. Depending on each game’s particular combination of these components the result can be truly compelling or merely compulsive. Compelling games reward you for repeated play, investing the time they extract from you into a deepening experience. Usually this means the gradual building of skills. Each round of play, however frustrating, acts as practice, building reflexes and sharpening systemic understanding. Compelling games repay your time investment with the feeling of mastery. 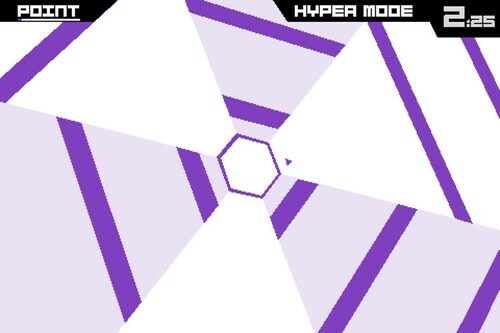 For me, an example of a compelling game is Terry Cavanaugh’s Super Hexagon. Super Hexagon is a brutally hard, fast-paced obstacle avoidance game where you rotate a small triangle to avoid a series of incoming geometric patterns of walls. The goal is to survive for 60 seconds on each level of difficulty without crashing into any walls. As a beginner, dying almost immediately is routine. The game displays your survival time down to the hundredths of a second. However, with each repetition you slowly build skill: increasing the speed and precision with which you move, learning how to avoid new patterns of walls, executing more consistently. You gradually survive longer and, eventually, beat each round. The difficulty ramps up smoothly as your skill improves, the current speed and batch of puzzles always seeming frustratingly impossible and the just-completed ones insultingly easy. Despite having played for countless hours, I’m proud of having beaten the Hexagonest stage and one of the three Hyper Mode stages (and of my current best time of 58:29 on “HARDESTEST”). These hours (built out of binges on long bus and plane trips and carved out of the interstices of the day) were devoted to building a skill. And, however arcane and useless that skill, its very difficulty gives it value to me. Compulsive play, on the other hand, wastes the time it wrings out of you. While compulsive games successfully kindle the Replay Urge, they fail to convert the resulting repetitive play into sufficient skill building. Playing compulsively leads to a feeling of self-disgust that grows stronger the longer you play. And it leaves behind no pride or skill, but only wasted time. For me, Threes is an example of a compulsive game. Created by Asher Vollmer and team, Threes is a clever variation on the Match Three genre of puzzle game made ubiquitous by Bejeweled and Candy Crush Saga. It presents you with a 4-by–4 grid, sparsely populated with numbered tiles. The goal is to merge tiles, combining their values into an ever-growing sum. On each turn, you swipe the grid left, right, up, or down, merging adjacent tiles that match, moving tiles into empty squares, and making room for the next arriving tile. White tiles start at 3 and match if they have the same number, combining into a doubling sum: 3s combine into 6, 6s into 12 and so on. Red and blue tiles, numbered 1 and 2, can only be merged with each other to create a 3. When your board is full and there’s no swipe direction that can merge two tiles to create an opening for the next tile, the game is over. You’re rewarded for creating the highest numbered tiles, with scores increasing geometrically with each doubling. The game has a minimalist style and satisfyingly smooth touch interactions both of which are highly reminiscent of Loren Brichter’s Letterpress. On first playing, it’s natural to enjoy simply batting the board back and forth, watching a few tiles merge as the empty spaces quickly fill up until the game ends. However, the problems begin as soon as you knuckle down and start trying to build skill and learn strategies to improve your score. Upon first hitting this phase, I wasn’t even sure if it was possible to have a strategy. Tiles seemed to arrive randomly, my options for how to deal with them were extremely limited, and, once the board started filling up, there didn’t seem to be any way to empty it again. After seeing Sermad Bruni tweet an impressive score, I asked him for tips and he replied with a few. @atduskgreg I try to keep one whole side empty. Keep movement in all directions. Don’t go for big numbers quickly. Keep a good spread. Luck! All of these are techniques for maintaining the maximum number of move options. 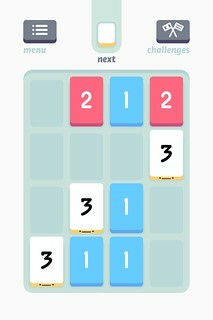 As rows or columns on the Threes board fill up with un-combinable tiles, swiping no longer moves them. When multiple red or blue tiles end up next to each other or move into the interior of the board, they become impossible to match and cause the board to quickly congeal. Large-numbered tiles have a similar effect. After putting this new understanding into action, my results improved somewhat. I started routinely scoring in the 2,000–4,000 range and, even had a couple of games where I constructed a 384 tile and scored over 8,000. 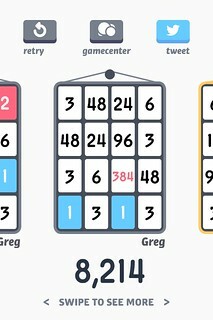 I began to see that Threes does require certain skills that can be learned and improved. Like with a Rubix cube, a toolkit of move combinations can be learned by rote to handle specific tactical situations: the leftward move that keeps two tiles on an outer row or column centered to leave more options to handle arriving tiles, the choice not to combine neighboring red and blue tiles in order to first correctly place an incoming tile, etc. However, my skill quickly plateaued. I wasn’t able to come up with any additional strategies that would improve my results and there were no Super Hexagon-like twitch skills to practice. Regardless, the power of the game’s Replay Urge kept me playing long batches of repeated rounds, my sense of self-disgust growing. I began to suspect that Threes is merely a compulsive game. But then Ashley Esqueda tweeted a link to this TouchArcade post by a user, y2kmp3, who created the highest-numbered tile in the game: 6144. y2kmp3’s post describes playing a single game of Threes for 10–15 hours to achieve this result. Rather than batting tiles back and forth y2kmp3 plans each move like a chess grandmaster, considering options and repercussions across a number of play sessions. This could not have been more different from the way in which I was playing Threes. Coming across this thread was like discovering a completely different game being played with the same pieces and rules I’d been using. Part of what boggles the mind about such an effort is that Threes doesn’t seem to give you enough information to conduct long-term planning. At any given point you know the state of the board: the potentially squashable pairs, the free directions of movement, and the next tile. That’s it. The presence of these random elements distinguishes Threes from Chess and Go and the other fully deterministic games where you normally see this kind of highly contemplative play. In these games the advantages or disadvantages of a proposed move could theoretically be fully analyzed given sufficient time, resources, and skill. This is obviously quite different from a game like Chess or Go where high-level strategy emerges as a negotiation between game rules and player personalities. Chess gandmasters are known for their inclinations towards particular styles of defensive or aggressive play, how they value different intermediate game objectives like movement and king protection, whether they’re stronger in tactics or positional play, etc. High-level Threes play seems to offer no possibilities for this type of personality expression. Instead strategies are dictated by the composition of the stack and the odds that govern random tile appearance. Beyond Threes’ limitations as a platform for high-skill strategic play, the game’s design has a bigger problem. Discovering y2kmp3’s post shocked me because the gap between that level of play and my own is so huge as to seem unbridgeable. Perusing the rest of that TouchArcade thread reveals an amazing research effort, chiefly lead by a user named kamikaze23, to reverse engineer the algorithm the game uses to populate the stack of next tiles. kamikaze23 solicited logs of Threes games from users, studied the patterns of tile appearance, and put together a speculative account of the algorithm that players like y2kmp3 use to the achieve their high scores. The need for this kind of research to understand the odds of the stack is evidence of a profound discontinuity in the curve of difficulty vs. increasing skill the game presents to players. It implies that all Threes players will hit the wall of frustration at which I currently find myself, unable to improve our abilities through iterative practice. Only a tiny minority of such players will decamp to the abstract realm of research and statistical study that’s apparently necessary to reach the higher levels of play. Abstract systematic analysis like this is how we solve problems that don’t yield to our basic ability to learn from experience. They’re at the core of our most rarefied rational endeavors like science and mathematics. The incongruity of requiring this mode of thought in a causal game is profound. As a game designer, I wonder about changes you could make to Threes to ameliorate this problem, to provide a smoother learning curve that would allow more users to ascend to these higher levels of play. The chief idea that occurs to me is to show the user more of the stack. The ability to see the next three or four tiles or more would facilitate longer-term planning and would make it easier to incrementally internalize the behavior of the complex stack algorithm described by kamikaze23. Further, currently all of the random elements are both biased against the player and purely destructive. I wonder if you could introduce an additional random element that would benefit the player and rebalance the game. Maybe a “wild tile” that could be combined with any neighbor like a blank Scrabble tile? This would let the player dig out of full and badly wedged boards and could result in an interesting set of strategic options around how long to save it and when to play it. Threes is obviously a carefully considered game that was the product of a great deal of design work. So, I’m aware of the hubris of cavalierly suggesting changes like these without the ability to playtest them. For all I know Vollmer tried these variations and found downsides I haven’t anticipated. And creating a game with players as dedicated to discovering high-level strategies as y2kmp3 and kamikaze23 is an achievement in itself. But, for me, as the game currently stands, playing feels compulsive instead of compelling and I regret much of the time I’ve spent playing it rather than feeling pride in it.